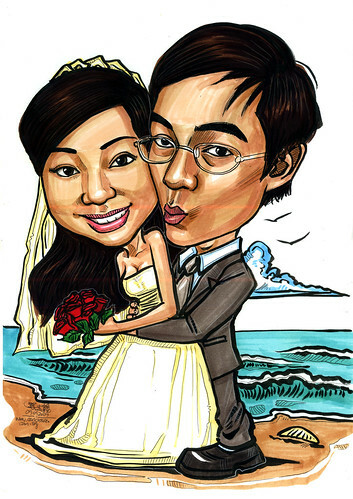 The client requested for a wedding theme, and setting is a beach. The groom is in this kissing posture in the photo provided. Not that I am a magician, who can change their expressions. But in fact, this is what the layman will think. "I am sure that you can make him smile in the drawing, even though he's not smiling in the photo." This is what I usually get from some of the clients. And I have to explain to them that, everyone's features and facial muscles are different. Thus, their expressions will change and look different from one another, which makes face drawings so interesting. We can just put your smile on another person's fce.